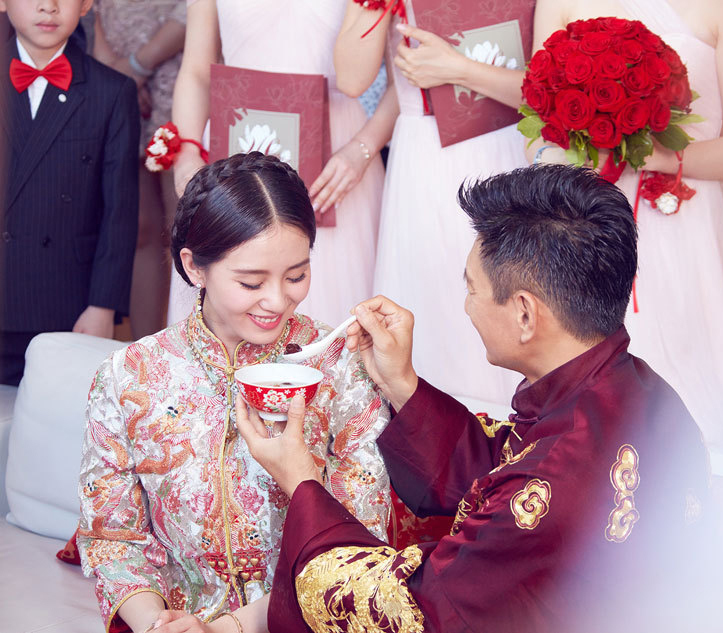 After registering their marriage last year, 29-year-old Cecilia Liu (劉詩詩) and 45-year-old Nicky Wu (吳奇隆) held their wedding banquet in Bali, Indonesia on March 20. Romantically linked since 2011’s Bu Bu Jing Xin <步步驚心>, the couple finally declared their dating status in 2013. Nicky vows to treasure Cecilia as his wife, and hopes that they can have five children. During the exchange of wedding vows, Nicky declared, “It was more than once that I complained about God. I thought that God didn’t treat me fairly, letting me go through many strange ordeals and unhappy events. Now, I understand why. He was saving the best for last to give me.” Lifting Cecilia’s veil, Nicky kissed the bride for ten seconds and scooped her up in his arms for a full spin. 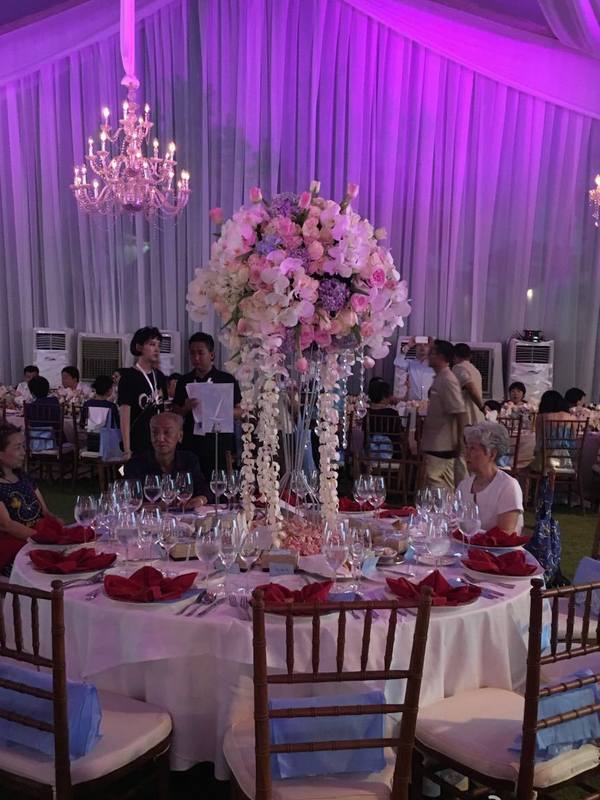 To give Cecilia a memorable wedding, Nicky spent 20 million RMB and even booked six airplanes to transport flowers, equipment, and attire for the wedding. 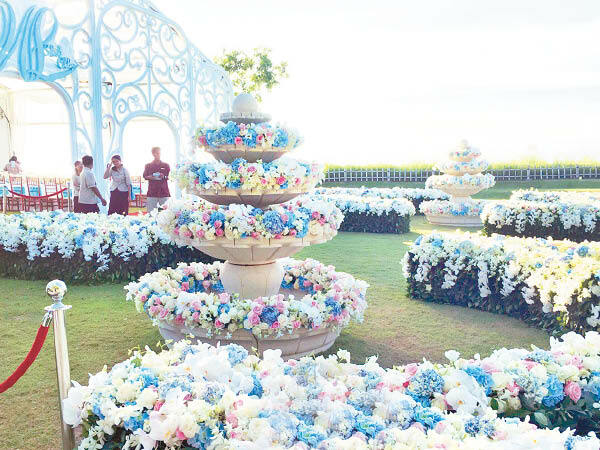 Over 400,000 flowers were flown directly from Ecuador and the Netherlands to decorate their exclusive beach-side wedding venue, Ayana Sky Lawn. Cecilia wore a custom-designed wedding gown from Carven which cost 3.6 million RMB. Nicky wore a gray Dolce and Gabbana suit. Many cast members from Bu Bu Jing Xin were present, and Annie Liu (劉心悠) was the Maid of Honor. Justin Yuan, Ye Zuxin (葉祖新), Damian Lau (劉松仁), Cristy Guo (郭曉婷), and Ye Qing (葉青) also attended. Kenny Lin‘s (林更新) absence sparked rumors that he did not get along with the couple, but Kenny later sent congratulations only. Kevin Cheng (鄭嘉穎) was noticeably absent. I am so happy for both of them. They look really beautiful as a couple! Too bad not everyone could make it as it was overseas. Apparently hu ge missed it as well due to family mayters. I was looking forward to a reunion of the chinese palqdin 3 cast but oh well. It looked like a lovely cceremony. Whoa…what a beautiful wedding. Best wishes to them! 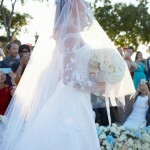 i hope LSS cherishes her husband…he has really given her a beautiful wedding. What a beautiful wedding! I love their Chinese wedding outfits! Really pretty as remind me of their character in BBJX! Love this couple!!! Worth every penny. All guests I guess had 3 days vacation. Beautiful wedding, lucky bride since Nicky is a great kisser and lucky groom since bride looks genuinely smitten as much as Cecilia can look smitten. 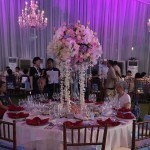 @funnlim I thought the floral sculptures were stunning. The seaside resort is very beautiful. Nicky’s speech about “God saving the best for last” for him is very sweet. He had it difficult, with rrpayinf his father’s debts for 12 years and divorce from first wife. From the sound of things, they want babies soon. Maybe later this year, we’ll hear some good news. @funnlim nicky looks so smitten with his bride…i wish them happiness especially for nicky who went through so much. If they plan to have 5 kids they better start it soon since he’s 45 years old and I wonder does he have any kid from his ex wife? I never knew they know Fala or Damien Lau. I remember Sharon Chan wedding was at Bali too. Anyway would like to congrats to this 2 beautiful couple. Nicky still looking good for his age. @asian2015 If they want five kids they should have one every year. 🙂 NW did not have any child with the 1st wife. I think LSS knows Fala because they both were in the drama “Sound of the Desert” & they know Damien Lau through “Bu Bu Jing Xin”. @dramas4me Thanks for telling me. Lol. maybe they can be like Moses and Aimee Chan. He’s rich I’m sure they can afford babysitters. @asian2015 I can see two or three kids for them, but not five. What if LSS doesn’t want to give up her acting career totally yet? @dramas4me we’ll see about that. Nicky is rich if he wants more kids then she can stay home be a housewife then later on when their kids grow older she can go back to work again. @dramas4me Nicky must be kidding! 5 kids???? Even Cathy tsui is stopping at 4. Is LSS ready to give up her career? This is really ‘wedding of the year’!!! 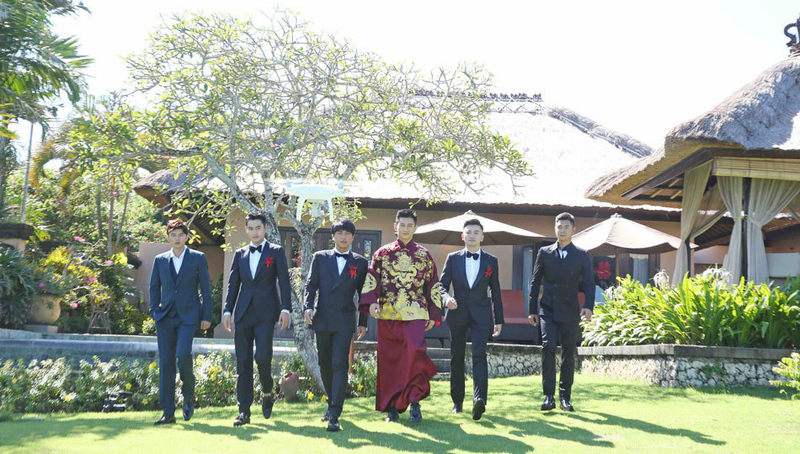 Getting Damien lau to officiate the wedding is so appropriate as he played the role of emperor kangxi in the drama they first met. Saying is one thing, but having them or not is a different story. I know many couples who want this and that,but in the end only have 1-2 kids at most. Many things are easier said then done. 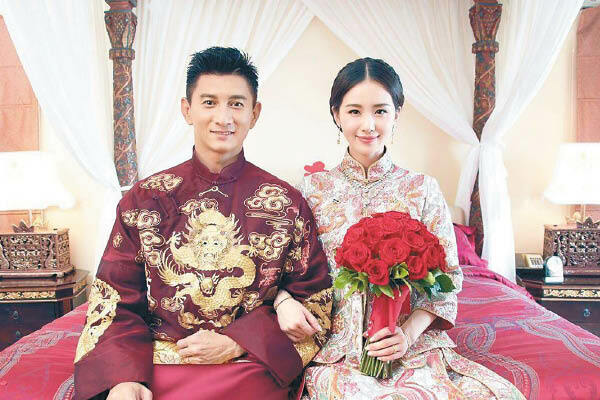 How much did AB and Huang Xiao Ming’s wedding cost? Just as much? Strangely i don’t see anyone bashing this couple for their extravagance ( though of cos he can well afford it but to pay such an obscene sum just for say the gown is very OTT and show-offy to me). Plus him showering her with his wealth and everyone is praising him. If it had been someone else the comments would go along the lines of ” oh he’s buying her love” or ” oh she’s a gold digger”. Double standards much. @isay Lol. Hey at least she’s not married a sugar daddy. @isay I think it’s unfair to say that about this couple. @ayang 20 or 200 million rmb are still crazy obscene sums. These people print money??? Ordinary folks like us just can’t imagine wearing a house on our finger lol! @dramas4me exactly. There’s something about HXM’s wedding that made it seem showy whereas NW and LSS wedding seemed more intimate and romantic. Out of all three weddings although I would have loved Jay Chou’s wedding, I love NW and LSS’s wedding the most. 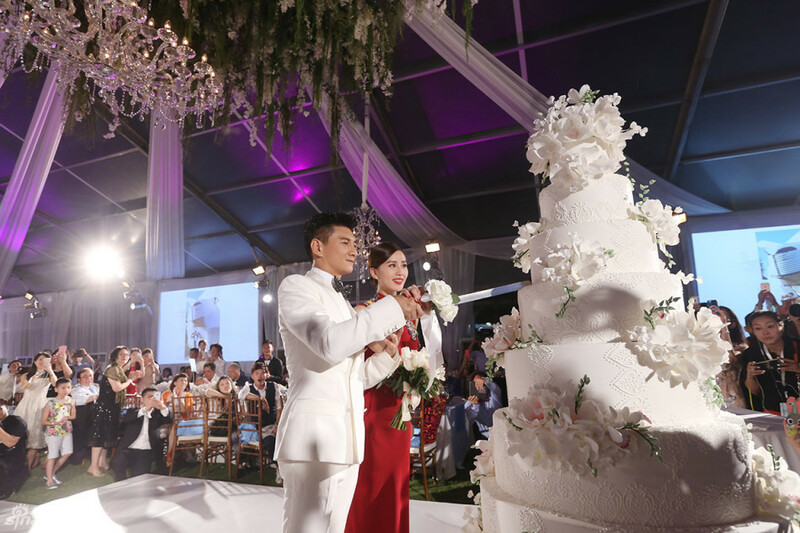 Out of three big weddings: Jay Chou, HXM & NW – I like NW’s wedding the most. It made you feel close & intimate with their families & friends. 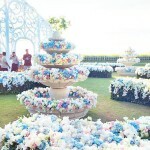 @dramas4me I like NW and LSS wedding.. it seem very private even though there are still 300 guest.. Also seem very romantic. 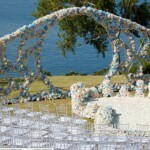 I was not a fan of HXM and ABB wedding.. nor Jay’s wedding.. too showy!!! ABB ring is also ugly imo! @isay don’t know about HXM’s wedding…but Nicky giving 60% shares to LSS seems show off. He is so in love with her. Super lucky woman. I actually do not consider him giving her 60% of his shares as a show off type of gesture. I think he is blindly in love with her and hopes that their marriage will last a lifetime(hopefully it does) and the biggest thing that I see is he trusts her enough that she will not just take it and run if things do not work out in the long run. Anyways, hope they have a lifetime of happiness! I know what you mean and have the same thoughts you do. Prior to the wedding, everyone was praising her to be frugal and admired her for it and all,but now we see how much they spent and all. You really wonder what was up with all of the stuff about being frugal and all. @isay i heard lss-nw wedding are mainly sponsored. Things like decorations, flowers and wedding dress are given by sponsored. 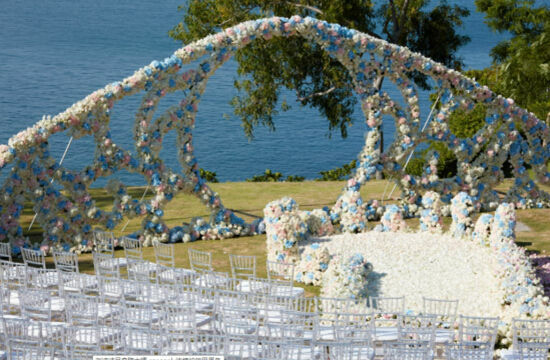 The estimate cost for their wedding is around $180,000 and thats for accomodation for 300 guests. I believe hxm-abb wedding also heavily sponsored, and they also sell their wedding to the media, which they received a lot of money too. A lot of media said their wedding didn’t cost as much as reported (as in using their own money), because of their celebrity status, many sponsored their wedding. Ok just found out that Hu Ge could not come due to his father getting injured. Kevin was not invited because he claimed they knew he was lazy and did not like to travel far. However, he denied not getting along with them. @hetieshou was wondering where was Hu ge. Kevin not invited? I suppose he wasn’t close to them. But yang mi was very close. And was tang Yan there? Kevin claimed that they all know how lazy he us to travel so if anyone invited him to a faraway place for a wedding,he would debate for a long time on whether to go or not. Therefore, they did not invite him to save him from going through that as he claims. But he claims it had nothing to do with not getting along with them. I wonder why Yang Mi did not go. She did not go to Huang Xiao Ming’s wedding too. I heard she said it was because she had to take care of her daughter. I was wondering about a Tang Yan too. I think she was invited but could not make it,maybe due to work? Not sure. I wish they all came because it would have been a Xian Jian 3 reunion if they did. I wonder if Han Dong came? Was he invited? It seemed like the cast of BBJX were all very close. I am glad the rest of the cast made it. Love seeing them all together. @hetieshou I believe yang mi was not invited. Knew he was too lazy to travel? LOL!! That’s a good line for dissing someone whom you do not like. I am sure the cast did not appreciate the way the HK media portrayed KC as the “STAR” from the drama. That was what Kevin said but not sure if it is true or not. He said weddings in HK are best because he does not need to go far. Not sure if that is true that the rest of cast felt that way. From what I feel based on all of the behind the scenes stuff,shows,etc… It really felt that the cast got along well and are close. Hey,but they are actors and can fake it too. Only they would know that.